There's really not much for me to review packaging-wise, so let's read some terrible jokes and then get right into the review! 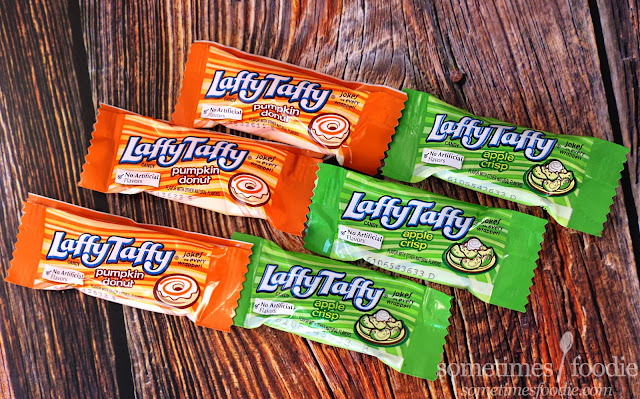 First up, Pumpkin Donut LaffyTaffy, what your got for me? Ohh! Clowns? This one is kind of topical, what with all the crazy clown sightings going on in the country. 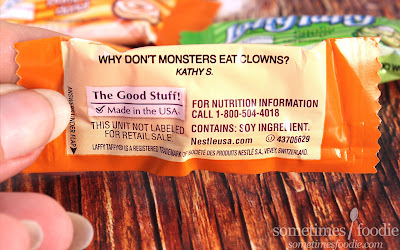 So, "Why don't monsters eat clowns?" This is an oldie. You guys ready? 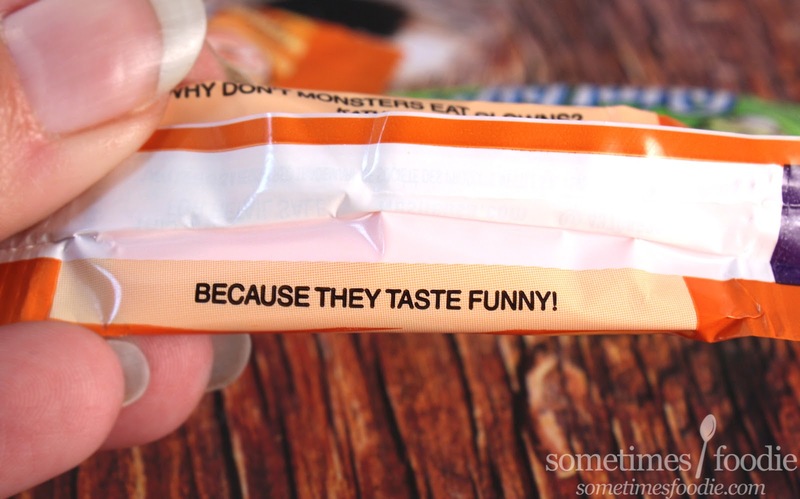 BECAUSE THEY TASTE FUNNY! Yeah, not the funniest joke ever, and it's kind of tired, but LaffyTaffy (or at least Kathy S.) tried. Apple Crisp, you got something a little less...stale? Okay, first of all this is an awesome name, "A. Ockles"? I just keep looking at it instead of the joke! 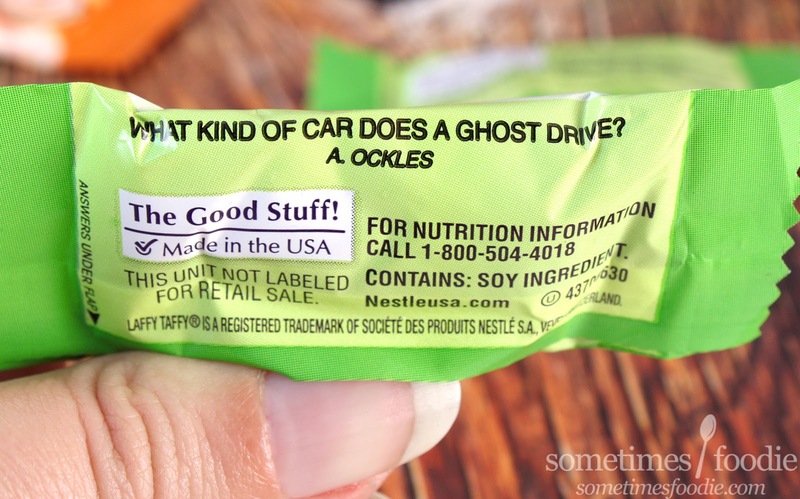 So this time our candy asks, "What kind of car does a ghost drive?" Ooh! A tougher one. Admittedly I know little to nothing about cars, so the first thing that popped into my head was a jalopy, so like...as boo-lopy? A corpse-vette? 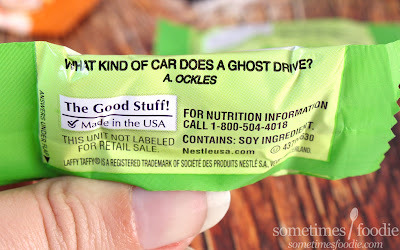 Okay I give up, what car does a ghost drive? Joke-time is over, time to tear these open and give them a try! To be honest, my expectations are SUPER low. I'm normally not a LaffyTaffy fan, although I LOVED the easter coconut flavor, and neither of these flavors sound all that appealing, but I'm going to try them anyway. You never know, right? Pumpkin Donut - not as bad as I had expected! 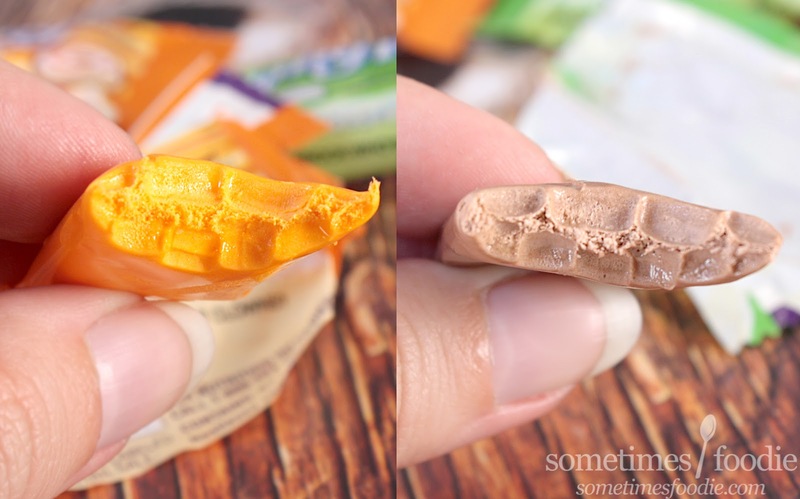 It's a bright orange color and it smells sweet with a hint of pumpkin spice. I took a bite, and it was spiced, but mild. I don't really get the "donut" flavoring, but it's like a pumpkin spiced vanilla taffy, and it was actually pretty pleasant. Not something I would buy a whole bag of, or stock up on, but I liked this one more than most of the year-round LaffyTaffy offerings. Apple Crisp - I was surprised that it wasn't bright green, like the wrapper. This one is a spicy brown color and it smells like cinnamon and green apple flavoring. Which is pretty much what it tastes like as well. This was the surprise winner for me. 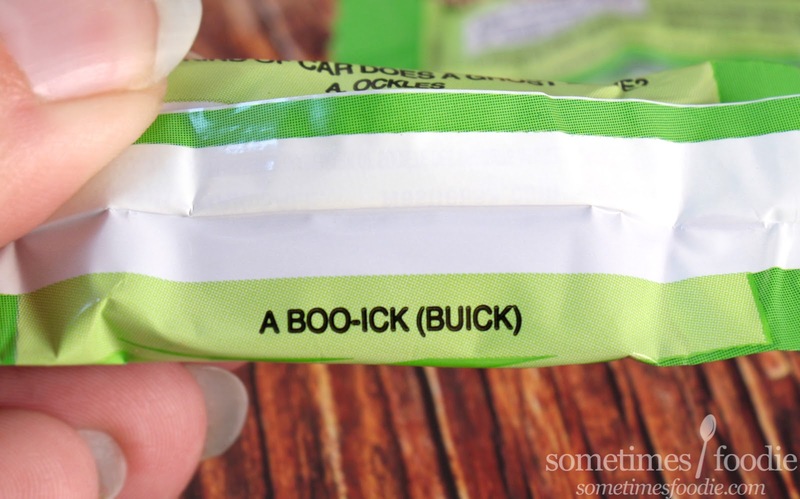 Normally I don't like green apple flavored candies, because they seem so artificial, and even though this one is on the fake-chemical-y-side, the cinnamon and spice flavors keep it grounded in reality. I find myself reaching for this one a lot more than the pumpkin donut one, and I am seriously surprised by how well this flavor works in taffy-form. On a Pumpkin Scale of 1-5 (5 being the most pumpkin-y) I’d give this a 2.5. Not very pumpkin-y at all, a little spiced, but very fall-friendly. Also, it gets an extra .5 points because it doesn't taste like a Bath & Body Works candle like I expected it to, so that bumps it up to a 3.